If you are an active service member, veteran or dependant with information related to environmental contamination on Okinawa, I am currently gathering testimonies and, with authors' permission, publishing them here. You can contact me on- or off- the record via this form. Three more BVA wins for Okinawa veterans exposed to defoliants from retrograde / vehicles while serving on the island. Two more wins for veterans exposed to Agent Orange on Okinawa. -- Citation Nr: 1721360. "The Veteran served as an Air Force Security Policeman on Kadena Air Force Base (AFB), specifically Camp Kinser, located in Okinawa, Japan. The Veteran alleges that while stationed in Okinawa, barrels of herbicide agents were sent from Vietnam to Okinawa before being taken to Johnston Island (Atoll)... Service connection is granted for coronary artery disease, to include as due to herbicide exposure. Service connection is granted for diabetes mellitus, type 2, to include as due to herbicide exposure." Full text here. -- Citation Nr: 1731591. "Prior to the Veteran's death, he contended that his service in Okinawa (between 1972 and 1973) caused him to be exposed, on a direct basis, to tactical herbicides such as Agent Orange. The Veteran asserted that the chemicals were sprayed in his proximity as a means to control vegetation, and also, that in his role as an ammunition specialist, he would physically remove drums of Agent Orange from ships to be either placed into temporary storage or to be moved onward to other locations in the Pacific (e.g. Johnston Atoll)... Entitlement to service connection for lung cancer is granted." Full text here. There have been two more VA wins for veterans exposed to dioxin-herbicides on Okinawa. -- Citation Nr: 1635277. "The Veteran, who is the appellant, served on active duty from May 1968 to May 1970. His primary military occupational specialty was as a longshoreman. From October 1968 to May 1970, he was assigned to the 412th Transportation Company, United States Army Riyuku (sic) Islands (Okinawa)." Full text here. -- Citation Nr: 1543352. "The Veteran explained that, approximately 15 to16 times a day, for 18 months, he regularly inhaled and ingested 2,4,-D; and 2,4,5-T, and dioxin-treated dirt, that covered his skin. He was exposed, inhaled, ingested, and absorbed 2,4,-D; and 2,4,5-T, and dioxin-treated dirt about 5,850 to 6,000 times while at Naha Air Force Base in Okinawa." Full text here. Confirmed: Two more U.S. veterans who believe they were exposed to Agent Orange on Okinawa have been awarded compensation from the U.S government. Since the summer of 2013, more than 100 rusty barrels have been unearthed from land in Okinawa City which was formerly part of Kadena Air Base, the Pentagon's busiest base during the Vietnam War. Tests on the barrels' contents have revealed the presence of the three tell-tale ingredients of Vietnam era defoliants - the herbicides 2,4,5-T and 2,4-D plus highly toxic TCDD dioxin. Japanese scientists agree that this is irrefutable evidence that U.S. military defoliants were present on Okinawa - and this paves the way for VA compensation for service members stationed on the island. Citizens' Network for Biodiversity in Okinawa, Naofumi Nakatato. 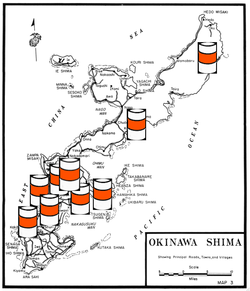 When the initial cache of 20+ barrels was unearthed, chemical analyses revealed 2,4,5-T and TCDD dioxin; international experts concluded this proved military defoliants had been present on Okinawa (see: here). However, the authorities denied their conclusions since 2,4-D had not been detected. In January 2014, 60+ more barrels were dug up and these contained traces of 2,4-D as well as 2,4,5-T and TCDD dioxin. Scientists again stated the presence of these three substances is the final proof that defoliants had been present on Okinawa (see: here). At the time of writing - November 2014 - further excavations are underway at 66 spots within the dumpsite where metal was detected. The results of these checks are expected to be announced in the spring of 2015. On 30 October 2014, I held a press conference at Tokyo's Foreign Correspondents' Club of Japan to raise awareness of the ongoing risks of Agent Orange on Okinawa. Watch the full press conference here - from 10'30". Read coverage of the conference here. Also talking was Dr Masami Kawamura - Director, Citizens' Network for Biological Diversity in Okinawa - who has been spearheading campaigns for Japanese-U.S. transparency related to military contamination including an appeal to Kadena Air Base available here. 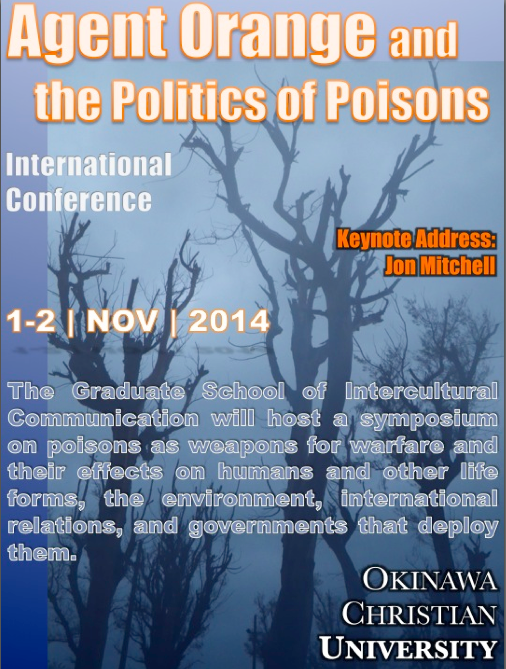 On 1-2 November 2014, I delivered the keynote speech at Okinawa's inaugural conference on the impact of military defoliants on the island - "Agent Orange and the Politics of Poisons" (Okinawa Christian University). The symposium brought together experts from Canada, the U.S., Vietnam, Okinawa and Japan to discuss how Okinawa might overcome military contamination. Another U.S. veteran has won VA benefits for exposure to Agent Orange on Okinawa. Click here for The Japan Times article. Click here for the full VA ruling. Some of these veterans maintain that defoliants were sprayed on the island to keep the fence lines and runways clear of vegetation; others allege surplus barrels were buried on Okinawa since it was cheaper than shipping them back to the United States. Many of these former service members are sick with illnesses identical to those suffered by Vietnamese people exposed to defoliants – some of their children are sick, too. These veterans possess photographs of defoliant barrels on Okinawa. Moreover, official records support the presence of military herbicides on the island. 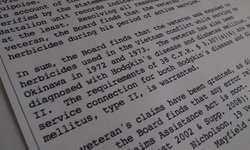 Among the paper trail proving that defoliants were present on Okinawa during the Vietnam War is a 1971 document about Agent Orange citing a herbicide stockpile at Kadena and a US government report stating that there were 25,000 barrels of Agent Orange on Okinawa in the early 1970s. In 2013 and 2014, more than 80 barrels were unearthed from former U.S. military land that used to belong to Kadena Air Base. Tests on these barrels revealed the presence of the telltale markers of defoliants - the herbicides 2,4,5-T and 2,4-D plus TCDD dioxin. Japanese and international scientists concluded this was irrefutable proof that the U.S. military had stored these poisons on the island. Despite this overwhelming evidence, the Pentagon denies these poisons were ever present on Okinawa - and it denies help to the service members sickened by these substances and Okinawan civilians who believe their water, land and health may have been damaged, too. The English-language version of Defoliated Island, an hour-long documentary about the usage of Agent Orange on Okinawa during the Vietnam War, is now online here. Produced by Okinawa TV station, QAB, the show won national acclaim in Japan when first aired in May 2012 - including an award for excellence from the Association of Commercial Broadcasters. It is hoped that the English version will pave the way for long-overdue investigations into the health impact on US veterans and Okinawa civilians - as well as the environmental damage to the island. 米軍は沖縄で枯れ葉剤を使用した？- Did the US military spray AO on Okinawa? 枯れ葉剤を浴びた島 ～「悪魔の島」- Defoliated Okinawa - "Island of Evil"
Records contain no information linking use or storage of Agent Orange or other herbicides in Okinawa. In 1998, Veteran Affairs ruling #9800877 was the first recognition from a US federal body that Agent Orange had been used on Okinawa. The decision awarded compensation to a former marine truck driver suffering from prostate cancer. The ruling was not made public until 2007 - but when it was finally revealed, it hit newspaper headlines around the world. For three years, the issue fell out of the public eye. Then in 2010, I met residents of the Yambaru jungles where the 1998 ruling had applied - so I wrote this article for a Washington DC think-tank. Following that article, I received a barrage of emails from veterans who had their own tales to tell about their experiences of Agent Orange on Okinawa - including former Air Force member, Joe Sipala, who provided a photograph of a barrel of the defoliant on the island. In April, 2011, The Japan Times ran their testimonies. The April article encouraged many other veterans to come forward with accounts of their use, storage and loading of Agent Orange on bases including Camp Schwab, Kadena and Futenma. In August, I presented these findings at a symposium at Okinawa Christian University. You can watch the full presentation here. The story made the headlines of both the Okinawa dailies - the Okinawa Times and Ryukyu Shimpo - and the mainland Japanese newspapers and TV news. The coverage prompted Japan's Foreign Minister to pledge an investigation. On August 13, The Japan Times ran my article on the alleged burial of dozens of barrels of Agent Orange in Chatan. 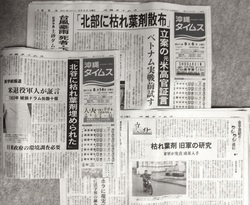 Once again, the Okinawa Times, TV news and Japanese dailies were quick to follow up. On August 16th, Okinawa Prefecture asked the national government to launch a full investigation into the Chatan burial [ update ]. Then the following day, the Mayor of Chatan, officially asked for a full investigation - the story was reported widely by TV news here. On August 19th, Stars and Stripes, the US military newspaper, picked up on the issue in the article, "Okinawan mayor urges probe into Agent Orange allegations". Then on the evening of the 19th, the Japanese Ministry of Foreign Affairs put out an official press release stating that the US Department of Defense had once again been unable to find any evidence of Agent Orange on Okinawa. The Japanese government has asked them to re-open its enquiries. On 20th August, The Japan Times reported this: "We are not saying the issue has been resolved because the U.S. answered our question. We are continuing the exchange," the [Japanese government] official said. The U.S. "said there were no (records), but there have been testimonies and . . . there were parts in the U.S. response that needed further confirmation." On 24th, my article on a female marine's struggle for justice was published - including new testimonies from veterans which may force the VA to reconsider its denials of healthcare support. Meanwhile, Okinawa Times has been at the forefront of pushing this issue in the Japanese-language media - with this September 6th front page scoop uncovering a high-ranking u.s. official's account of defoliant experiments on the island in the early '60s. Not to be outdone, on September 12th, Japan Focus ran my article outlining the latest findings that suggest defoliants were buried on Futenma and Kadena Air Bases - and sprayed around a school attended by American students. On 14th September, the Mainichi Shimbun picked up and ran with the alleged burials on Kadena and Futenma - while Scott Parton's account of the use of defoliants on Camp Schwab made the nightly TV news. On September 24th, "Living The Silent Spring" - a Japanese documentary about Agent Orange - received its premiere in Tokyo. Its brochure includes my essay on Agent Orange on Okinawa which you can now read in English at Foreign Policy in Focus or in Japanese here. At the end of September, Nago City Council became the first to adopt an official resolution calling for a full investigation of the use of military defoliants on the island. Other municipalities have followed suit with demands for Washington and Tokyo to come clean. On October 18th, The Japan Times published allegations that Agent Orange was used and stored on Camp Schwab - the base slated as the site for MCAS Futenma's replacement. The following day, the governor of Okinawa was among municipal leaders who announced they'd push Tokyo and the Pentagon into a full inquest into military defoliants on the island. On 19th October, the leaders of three Okinawa municipalities (Chatan, Kadena and Okinawa City) met Japan's Minister of Foreign Affairs, Koichiro Gemba. They requested a wide-ranging investigation into the Agent Orange issue. Meanwhile three days later, the Mayor of Chatan met the deputy Chief Cabinet Secretary and asked him for reassurances on the burial of defoliants in his town - the story I broke back in the summer. On 28th October, Okinawa's governor, Hirokazu Nakaima, met the US Ambassador to Tokyo and requested him to investigate the claims of former service members. Ambassador Roos pledged his cooperation. On 4th November, I gave a press conference on Okinawa to update the Japanese-language media on my latest research. I discussed evidence I've uncovered about the use of defoliants on Iejima island in 1973 and the storage of Agent Orange on MCAS Futenma. Perhaps most significantly, I also introduced this 1966 Air Force document which appears to controvert Pentagon denials that military herbicides were ever present on the island. The document made front page of the Okinawa Times, while the press conference was picked up by an alphabet-soup of TV stations including OTV, RBC, QAB and NHK. At the press conference, Okinawan civilians also voiced their experiences of using and seeing US defoliants during the 1960s and '70s - including shorelines stripped of vegetation, bartered barrels and areas of jungle still stripped bare today four decades on. QAB ran a 6-minute special about Agent Orange on 10th November which can be seen here. On November 24th, the Okinawan office of the Ministry of Foreign Affairs (MOFA) refused to cooperate with dioxin tests on Camp Schwab - despite demands from Nago's leaders. Dr Wayne Dwernychuk, a world-renowned dioxin expert who researched the impact of Agent Orange in Vietnam for more than 15 years, dismissed Iyori’s statement as “ludicrous”. Paul Sutton, former Chairperson of the Vietnam Veterans of America Agent Orange/Dioxin Committee, voiced similar disbelief regarding MOFA's comments: "Generally, herbicides were stored separately; but, when space was an issue, it was stored with other, non-herbicide material. There was evidence of this on Guam and in a number of places in Vietnam." "The only markings on the herbicide drums was a colored stripe around the center of the barrel denoting the type of herbicide." Not long after MOFA's denial was reported, The Asia-Pacific Journal ran my latest article, Agent Orange on Okinawa - New Evidence. On November 30th, The Japan Times published further testimony from the veteran who claimed that dozens of barrels of Agent Orange had been buried in Chatan. 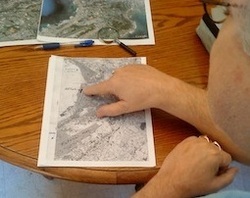 With the help of a 1970 map of the area, he was able to pinpoint the location of the alleged burial. Today, it is a busy resort neighborhood. A redacted version of the article was run by The Asia-Pacific Journal - including more information on the reluctance of both Tokyo and Washington to investigate these claims. On December 14th - in a snub to the Japanese and US governments - Chatan Town Council became the first municipality on Okinawa to allocate funds to dioxin testing on the former US air base where the Agent Orange is allegedly buried. The story was picked up by Stars&Stripes under the headline "Okinawa to test water near popular beach for Agent Orange." While, the tests are due to be conducted in January, 2012, there are worries that Chatan's water-based approach is inadequate to detect dioxins. Leading Agent Orange experts are currently advising town officials as to the most effective way to proceed. On December 15th, Nago City announced that it would conduct a survey of former base workers and local residents living near Camp Schwab who had come into contact with US defoliants during the '60s and '70s. 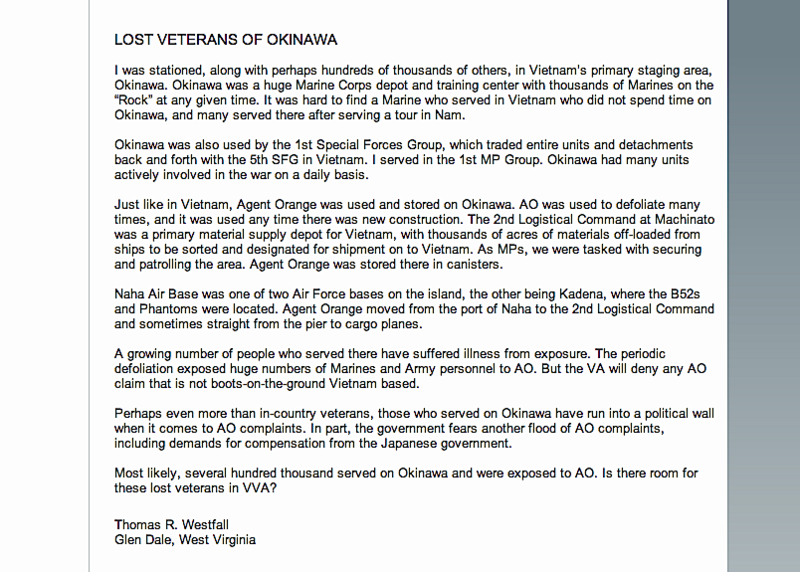 To herald 2012, the Vietnam Veterans of America official magazine published two letters about Agent Orange on Okinawa. The first is called Lost Veterans of Okinawa and the second is called A Hell of a Price. At the end of January, Komichi Ikeda from Tokyo's Environmental Research Institute went to Okinawa on a trip organised by Okinawa Biodiversity Network. She visited Chatan and the northern Yanbaru jungles in order to advise how municipalities might proceed with dioxin tests. Aware of how the Tokyo-based mass media has been neglecting the issue of Agent Orange on Okinawa, she has pledged her support in helping to put the problem into the public eye. On 31st January, I gave a talk about the issue to accompany a screening of "Living the Silent Spring" in Naha, Okinawa. QAB reported the event here and you can read a full text of the talk here. Ever since news of the 1998 VA ruling broke in 2007, it was thought that only one veteran has been awarded compensation for exposure to Agent Orange on Okinawa. After a comprehensive review of VA records, however, now two more cases have been revealed in this Japan Times article. In 2008, the VA ruled that a sick marine was exposed to dioxins while handling contaminated war equipment on Camp Courtney between 1972 and 1973. In 2010, a soldier who unloaded Agent Orange at Naha Port in 1966, was awarded benefits for lung cancer developed as a result of being soaked in defoliants. In order to help exposed veterans to file claims with the VA, Joe Sipala has created this guide on how to fill out a statement in support of claim. It guides veterans through the complex process - and points out the pitfalls along the way. 12 April 2012 marks one year since The Japan Times first published the testimonies of three US veterans regarding their exposure to herbicides on Okinawa. Since then, a further 30 former service members have spoken out about their experiences of loading, storing and spraying Agent Orange on the island. While Ryukyu Asahi Broadcasting and Okinawa Times have pursued this story from the very beginning, the mainland Japanese media has been slow to pick up on it. However all that seems set to change with the announcement by tv-asahi that it will air a 90-minute documentary on the issue on 20 May 2012. The program, The Scoop Special, will be filmed in Okinawa, Vietnam and the US - and it will feature interviews with former service members (including Joe Sipala, James Spencer and Scott Parton), Ryukyu base workers, Goro Nakamura and me. On April 15, The Japan Times headlined with my interview with Larry Carlson - one of only three US veterans to receive government compensation for exposure to Agent Orange on Okinawa. 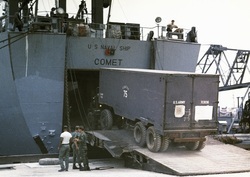 Carlson detailed the unloading of thousands of barrels of the toxin-laden herbicide at Naha Port from ships which included the Transglobe and Comet (right). 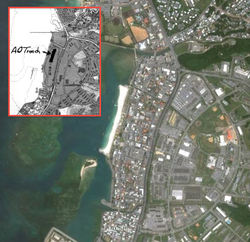 He also testified about its storage on Kadena Air Base and Camp Schwab. The VA award flies in the face of Washington's denials - and suggests a rift between the two governmental departments. Photograph of James Spencer and Jon Mitchell. Courtesy of QAB. On 15 May 2012 - to commemorate the 40th anniversary of Okinawa's reversion to Japanese control - Ryukyu Asahi Broadcasting aired a primetime documentary focusing on my research into defoliant usage on the islands during the Vietnam War era. The 60-minute show included interviews with 7 U.S. veterans and testimonies from local civilians. On May 17, The Japan Times ran an article on research conducted by Veterans Services Officer, Michelle Gatz, who has been relentlessly pursuing the paper trail of defoliant tests conducted by the Pentagon on Okinawa in 1962. 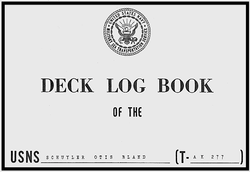 Gatz tracked down the 50-year old logbook of the SS Schuyler Otis Bland which showed this infamous herbicide transporter offloaded its cargo on Okinawa's White Beach port in the spring of '62 - a delivery sandwiched between classified AO runs to Vietnam and the Panama Canal Zone. On May 20, TV-Asahi broadcast a 90-minute documentary featuring interviews with sixteen US veterans exposed to Agent Orange on Okinawa. The program was hosted by Shuntaro Torigoe - one of Japan's leading reporters - and sparked off an immediate backlash from Tokyo's Ministry of Foreign Affairs which, once again, quoted the Pentagon's denial that AO was ever on the island. TV-Asahi has pledged to pursue this issue with a follow-up documentary in the autumn of 2012. Meanwhile, Citizens' Network for Biodiversity in Okinawa - the NGO leading the push for full disclosure of the AO issue on the islands - met with prefectural officials on June 1. The group demanded a comprehensive survey of both US veterans and former base workers but the prefecture refused - citing fears that such a survey would damage the reputation (read: "tourism and farming") of the island. A full report of the June 1 meeting is now available in English here. 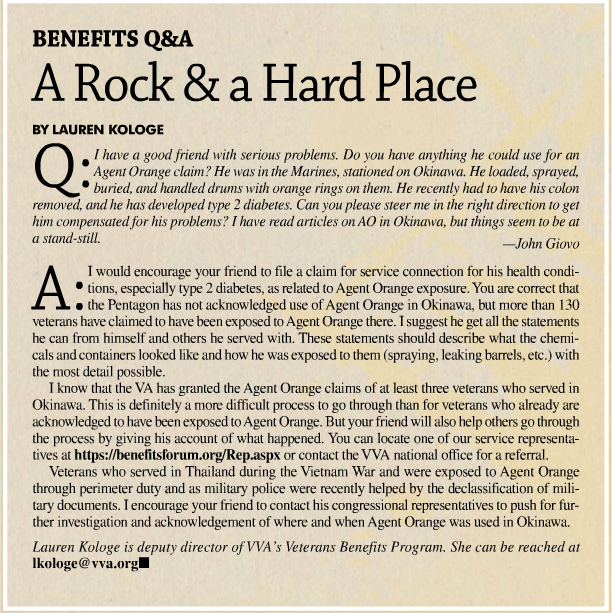 In May, the VVA Veteran magazine once again took up the Agent Orange Okinawa issue in an article titled A Rock and a Hard Place. The feature advised veterans on how to file claims for exposure on Okinawa and urged readers to contact their elected officials in order to make them aware of this tragedy. On June 15, The Japan Times headlined with retired Lieutenant Colonel Kris Roberts's account of the discovery - and subsequent cover-up - of a massive cache of Agent Orange on MCAS Futenma in 1981. The defoliants poisoned Roberts and he worries that his fellow marines and local residents may have been exposed, too. The story was picked up by Okinawan media - and Russia Today / Truthout / Zcomm- and Roberts's account will increase fears that even after Futenma is eventually returned to civilian usage, the land will be too polluted to develop for decades. The Futenma cover-up was briefly reported by Stars&Stripes - before being dropped like a hot rock. At the same time, The Huffington Post ran a summary of the AO story to date. In mid-July, Japanese periodical Sekai ran a long report and interview with me on the past 18 months' research into Agent Orange on Okinawa. Moreover, the National Association of Commercial Broadcasters lauded the documentary Defoliated Island and nominated it for its 2012 awards to be decided in September. The documentary's makers are currently coordinating an English-language version in order to help U.S. veterans with their struggle for recognition in the States. On August 7th, The Japan Times ran an article on US veterans who were poisoned by herbicides on Guam. The island continues to be heavily polluted - and the Environmental Protection Agency's reports offer a window into the situation on Okinawa where the military has refused such tests. On the same day, The Japan Times ran a report revealing a U.S. Army document which states that there were 25,000 barrels of Agent Orange on Okinawa in the early 1970s. The official report contradicts the Pentagon's repeated denials that these poisons were ever stored on the island - and looks likely to open the doors for veterans exposed on Okinawa. 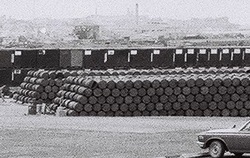 Following the report in The Japan Times, a photograph was discovered apparently showing the cache of 25,000 barrels stored on Camp Kinser in 1971. 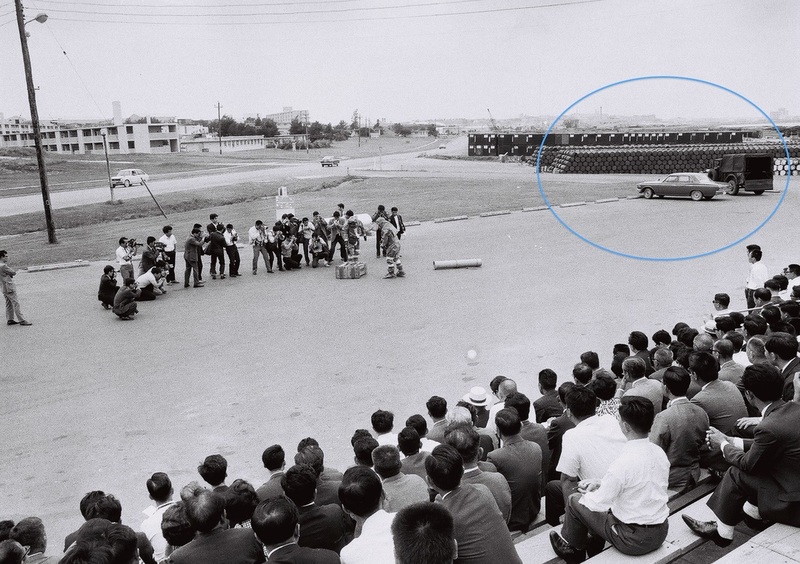 The photograph from Okinawa's Prefectural archives was taken during a U.S. Army media event designed to show off the military's safety procedures for any mishaps that occurred during Operation Red Hat. But now that picture appears to have turned around and shot them in the foot. At the end of August, U.S. Agent Orange campaigner, Heather Bowser visited Okinawa and gave a talk to residents. As a second-generation survivor, Bowser expressed solidarity to those affected. She called upon the American government to help its veterans exposed on Okinawa and she urged Tokyo to investigate the issue. In early September, Vietnam Veterans of America released their latest guide to Agent Orange exposure, adding a new entry among its list of locations where these poisons were used - Okinawa. In mid-September, Japan's National Association of Commercial Broadcasters awarded Defoliated Island with a commendation for excellence - a rare example of recognition from a mass media that usually shies away from Okinawan issues. On October 7, the third TV documentary about Agent Orange on Okinawa was aired nationally. Titled Defoliated Okinawa - Island of Evil, the QAB-produced show featured interviews with former base workers who sprayed defoliants on U.S. installations. For the first time, it also triangulated veterans' accounts with newspaper reports from the 1960s of the mass damage caused to bathers in the sea near areas sprayed by AO and the discovery of large numbers of mutated frogs. "Large quantities of [Agent Orange], the highly carcinogenic chemical warfare weapon used to devastate Vietnam's forests between 1962 and 1971 were stored in Okinawa; according to recent accounts given by former U.S. servicemen [sic], the drums occasionally broke open, and a large quantity of the substance was simply buried in a trench in the vicinity of the town of Chatan. It may also have been used for weed control on or around bases, and the Yambaru jungle may have served as a testing site for later large-scale use in Southeast Asia." This is further proof that the testimonies given by these former service members are changing the way the world looks at Okinawa - but still the Department of Veterans Affairs and Pentagon refuse to believe their accounts. On November 22, Caethe Goetz passed away from cancer caused by her exposure to Agent Orange while serving as a marine on Okinawa. Caethe was one of the first veterans to allow me to go public with her account - and over the past 18 months I'd corresponded with her regularly. "I never back down when I think I'm right - I just hang in there until the end. 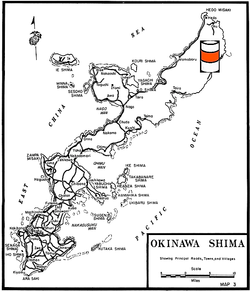 I would love to be able to form a group of Okinawa veterans who could make a stand together. There is more power in a multiple of voices than just one lone one." In December 2012, the U.S. magazine Vietnam became the first mainstream media in the States to pick up on the usage of Agent Orange on Okinawa. Its article titled "Drums of Agent Orange in Okinawa Cited in Army Report" summarized The Japan Times investigation of the past 18 months - and ended with the comment "so far Tokyo has refused to do any environmental testing." "On December 14 a local NGO met the Ministry of Foreign Affairs Okinawa Liaison Office over the issues of AO on Okinawa. Mr. Kanzo Kawaguchi, MoFA officer, reiterated explanations provided by the US government regarding AO related documents and US veterans’ testimonies while stating that the Japanese government stands by the explanations. As for the Army document “An Ecological Assessment Report of Johnston Atoll”, Mr. Kawaguchi stated that the GoJ was told by the US G that “the description that ‘[Herbicide Orange] was stored on Okinawa’ is inaccurate” and that the GoJ stands by the US explanation. Mr. Kawaguchi also told that, while the GoJ recognizes two cases (1998 and 2008) in which the veterans’ claims for being exposed to AO while serving in Okinawa were granted by the US Department of Veterans Affairs, the GoJ does not intend to conduct its own investigation. As for the NGO’s request for the GoJ to disclose how it communicates with the US in its fact-finding inquiries, Mr. Kawaguchi told that the GoJ cannot provide such information as a matter of its policy and procedures." On 12 January 2013, The Japan Times ran a front-page article featuring a 1971 U.S. Army report. The document was created in response to the '70 White House ban on Agent Orange and it summarised the current status of defoliation projects in Vietnam. Among the locations where it states herbicides were stored was Kadena, Okinawa. USFJ is currently looking into the report. The Japanese daily newspapers followed-up on the Kadena report - calling for a full government-backed investigation of the usage of Agent Orange on Okinawa. QAB - the TV station spearheading investigations in Japan - ran the story on their primetime news show. 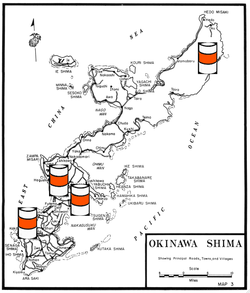 Their report brought together the 1971 document with accounts of a former Okinawa base worker who witnessed spraying from orange-striped barrels within the installation. In February 2013, I received information that the Pentagon was on the verge of releasing the results of an investigation into my coverage of Agent Orange on Okinawa. The report was set to deny that Agent Orange had been on Okinawa while upholding veterans accounts that chemicals (including pesticides) had been illicitly dumped on the island. The man chosen to head the Pentagon investigation was Dr Alvin Young - a controversial selection given his past reports. The Japan Times ran the story on February 15. In March 2013, the Pentagon released the results of a 9-month investigation into my coverage of Agent Orange on Okinawa. I have uploaded the full text of the report here and the DoD's summary of the report here.